The Middle School is a transition time for students who are entering their young adolescent phase. Boys and girls, aged between 10 and 13 [Grades 5 to 7], begin to develop mature and abstract ways of thinking. They continue to enhance the skills learned in Junior School, but begin to equip themselves for transition into the Senior school. 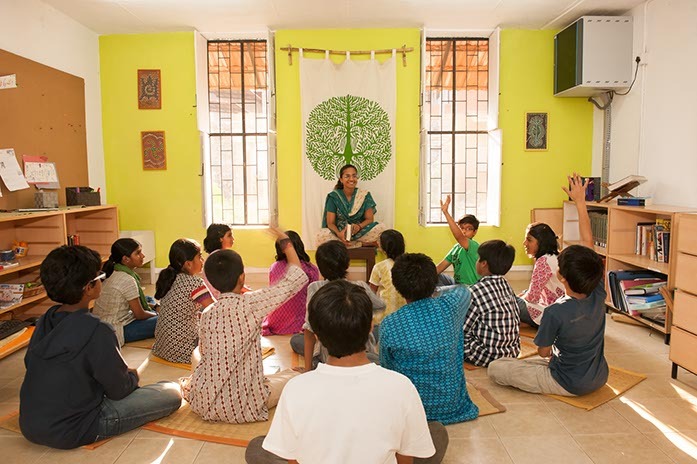 Similar to the Junior School, students in the Middle School study in vertical age groups; their homes are their learning spaces, and their main teachers are also their house parents. Having been rooted in inspirational choice based learning in the Junior School, students are now exposed to a seemingly more structured syllabus. The teaching pedagogy now involves an amalgamation of best practices in teaching to facilitate both guided and self-directed learning. The classroom is conducted via a mixture of timed instructional periods and fluid learning blocks. Within this latticed approach, there are specific points of integration. An integrated 3-year curriculum provides students with the opportunity to see the interconnections of different disciplines and develop key learning skills in every subject. Students now begin to show their inherent strengths and weaknesses, innate talent and skills. The unique ‘home school’ pedagogy enables teachers to cater to different needs and talents in the students. The student is now encouraged to take ownership and responsibility for his/her education. Various activities and assessment programs are geared to promote independent learning skills. The emphasis is on learning ‘how’ to learn. Each student is also allowed to pursue multiple co-curricular interests, participate in workshops and clubs, go on treks and field trips. These opportunities also become focal loci for further learning in the classroom. As in Junior School, there are no yearly examinations. The student follows a 3-year plan embedded with regular assessments and evaluations. They transit to Senior School once they exhibit ease and proficiency with key content and skills, and are now ready to follow a more prescribed syllabus and participate in formal examinations.